Premium ULR-Tips and ULR-Filter Tips (described in a separate page) are manufactured in Germany by AHN Biotechnology as a very high quality product meeting the most stringent manufacturing standards for the most discriminating users and at affordable prices. 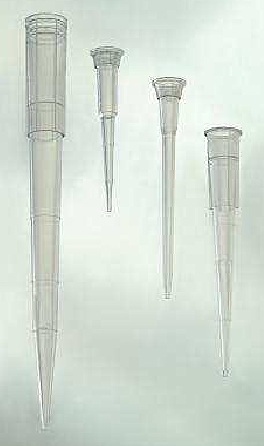 Sample retention can be a major contributor to pipetting inaccuracy and inconsistency, and siliconization of tips has proved unsatisfactory because of autoclaving and contamination problems. AHN Biotechnology has developed a new polypropylene polymer that provides a very slick surface on the ULR-Tips that improve with autoclaving and cannot leach from the tip surface. This new polymer gives AHN ULR-Tips ultra low retention properties, reducing tip retention nearly 85% and decreasing standard deviation of the retained volume by more than 75%. In particular AHN ULR Tips significantly reduce the amount of DNA and protein bound by the tip. AHN ULR-Tips, like AHN Top-Line tips, are beveled at the opening to avoid capillary bleeding in which liquid creeps up on the outside of the tip when dispensing, leading to sample crossing..
AHN ULR-Filter Tips, like AHN Filter Tips, have a hydrophobic barrier preventing cross-contamination of sample fluids or vapors getting contact with the pipette shaft, making them ideal for PCR work or applications involving biohazardous, radioactive or corrosive materials. Tips and other plastic products from AHN Biotechnology are manufactured on state of the art equipment in accordance with ISO 9001 and DIN standards.. The use of lubricants that may be harmful to samples is eliminated from the manufacturing process. All dyes used to color the range of AHN products are guaranteed to be completely metal free, eliminating any risk of sample contamination by trace elements. AHN tips are fully autoclavable (121°C, 0,1 Mpa, 20 min.). Free of human DNA, certified free of DNase, RNase, Pyrogen and PCR inhibitors. Available in bag and racks, sterile or non-sterile, and in volume case lots as well.